The decision to start an office for your business may be one of the most complex and unfamiliar decisions that you will have to make. This guide will take you through the process of starting up your own office and help you make the right decisions that are critical to your success. 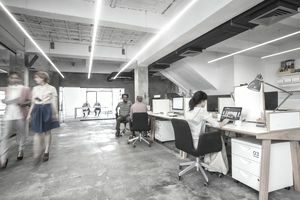 The most important task that will ensure the success of this project is to assemble a budget that captures all of the costs to set up your office. Unless you have an unlimited supply of money, the finances required to furnish your space and buy everything you need will be your most limiting resource. A simple spreadsheet that details each one of the sections listed below will help you calculate the total cost of starting your office. If money is tight and credit is a problem, you can implement money-saving ideas such as renting office furniture. Do I Need an Office or Can I Work at Home? Running your office at home can save you a lot of money, but there are seven questions you need to answer before you make this decision. Consider each one carefully and the impact it will have on your business and the other people in your home. Your taxes may be affected, and your family may not embrace the thought of having to tiptoe around while you're "at work" in your home. Get off on the right foot and success will be yours. Start on the wrong foot and you will struggle through the remaining tasks. If working at home doesn't make sense for you, your business and your family, it's time to find office space outside your home. Commercial real estate can be unfamiliar territory, but the task is important, and you can work with commercial brokers to find a space that works. Determining the right amount of office space in the right location will help the business over the long term. Regardless of whether you will be working at home or in office space outside your home, you will need office furniture. Some pieces will be expensive, especially if you want high-quality pieces that look great for when clients stop by. Some furniture might be inexpensive, and you can always look for great deals on gently-used office furniture. Some items will be necessary, such as your desk, and other furniture will be a nice-to-have luxury. This guide will help you discern what you need and what you don't need. In addition, you will get some tips on saving money. In addition to furniture, your office will need a variety of office equipment. It is at this point in the project your budget can really get blown. Here is a list of office equipment and money saving tips that will help you stay within your budget by getting only the office equipment that is truly necessary. Also consider that you can lease certain types of office equipment, such as high-volume copiers, to save money. Last, but not least, are office supplies. This will most likely be the smallest line in your office start-up budget, but it can not be overlooked. Office supplies are not expensive but they must be accounted for in order to avoid spending more money than you have. Don't spend too much time on this task, but at the same time make sure it is not forgotten. Consider also whether you need any specialty supplies, given your line of business, and only order what you need for the next month or two. Office supplies are delivered quickly, so there's no need to store months' worth of supplies when you could be using your cash for other office-related items.